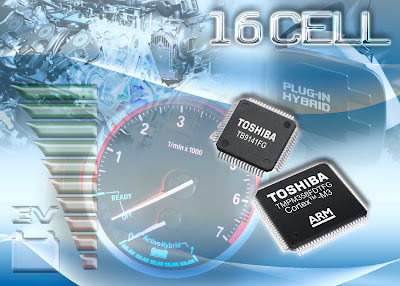 Toshiba today announced its Li-ion battery monitor chipset for automotive applications. The chipset includes the industry's first battery monitor IC capable of checking up to 16 cells per one IC, which simplifies design and lowers costs by reducing the number of components required in an automotive battery monitoring system. The new Toshiba chipset is ideal for Hybrid Electric Vehicles (HEV) and Electric Vehicles (EV), which require enhanced battery technology. "With increasing interest and adoption of electric cars, there is a growing need for chipsets that can improve the performance of the battery operation of these vehicles," said Deepak Mithani, director analog and imaging business unit, System LSI Group. "Our battery monitor chipset helps improve driving range and battery life and reduces battery costs, significant challenges for electric vehicles. We intend to aggressively expand into the battery monitor chipset business and continue providing solutions that support the unique requirements of hybrid and electric automobiles." Toshiba's new Li-ion battery monitor chipset is comprised of the TB9141FG 16-channel battery monitor IC and the TMPM358FDTFG automotive safety microcontroller. The chipset detects remaining battery levels, equalizes charging among the cells in a battery pack (cell balancing) and can also detect abnormal battery conditions. The TB9141FG uses a 96V mixed-signal process that allows it to monitor up to 16 cells at the same time. It also incorporates cell balancing switches for each cell and is able to measure battery voltage while cell balancing. The TB9141FG is able to communicate in a noisy environment, using differential signaling in a daisy chain communication link between two or more TB9141FGs, an important feature for automotive applications. The TMPM358FDTFG is a 32-bit RISC microcontroller built around an ARM® Cortex™ -M3 core and is compliant with functional safety standards such as IEC61508/ISO26262. Toshiba will provide a software library developed under an ISO26262 certified software development process2 to help make it easier for customers to build a safer and more reliable battery monitoring system. The TMPM358FDTFG is designed to be used in a fault-tolerant system and includes a backup power supply for timer circuits and for retaining data in a stand-by SRAM. When it is not monitoring batteries, the TMPM358FDTFG can enter a low-power stand-by mode, leading to lower power for the total system. The Toshiba Li-ion battery monitoring chipset, TB9141FG and TMPM358FDTFG, begins sampling in first quarter 2013. Volume production is expected by April 2014. Single-unit sample pricing is $10 for the TB9141 and $12 for the TMPM358 (US).